A Seattle man accused of walking into the middle of a busy Lake City street and randomly shooting passers-by told police he was in a drunken blackout during the rampage and didn’t remember any of it. King County prosecutors rush-filed criminal charges Friday against 33-year-old Tad-Michael Norman, accusing him of two counts of first-degree murder and three counts of attempted first-degree murder, each with a firearm enhancement. Norman remains in King County Jail on a no-bail hold. Seattle police say Norman claimed after his arrest that he was a recovering alcoholic who began drinking again. 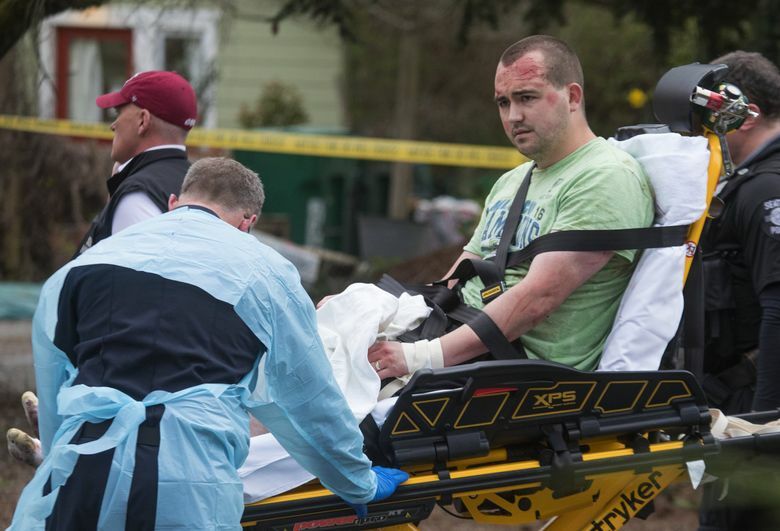 He said he has blackouts when he drinks and had no memory of Wednesday’s shooting when detectives told him about it as he was being treated for minor injuries at Harborview Medical Center. It is among the first personal details known about the accused shooter, who records show grew up in Mountlake Terrace and went to high school there. Norman earned an associate degree from Everett Community College in 2006, according to the college. Norman received a bachelor’s degree in sociology from the University of Washington in 2013, according to his LinkedIn profile. A check of available public records shows no criminal history. He grew up with his parents and two siblings in a rambler on a quiet street east of Interstate 5 in Mountlake Terrace. A man who answered the door Friday identified himself as Norman’s father, and said the family was not talking to the media. Efforts to contact other family members were not successful. Public records and social media reports show Tad-Michael Norman married in 2016, and a Facebook page – since taken down – contained a number of photographs of Norman with a smiling young woman and a corgi. A neighbor at his apartment building on Sand Point Way, who asked not to be identified, said Norman had complained about noise. She said he was a “classic” jerk – although she used a stronger word. Norman’s LinkedIn profile said he had worked as a contractor for Microsoft from June 2015 through July 2018, and that he was an accounts manager at allrecipes.com for nearly seven years before that. Norman told police he went to a Fred Meyer and bought alcohol, including vodka, rum and wine, and started drinking around 12:30 p.m. Wednesday, according to charging documents. The shooting occurred about 4 p.m. While at home, he told police, he played video games on an Xbox, which he said was common for him when he drinks, according to the charging documents. He added that he had no memory after that until he was in the hospital. If convicted as charged, Norman would face a standard-range sentence of 110 to 138 years in prison, O’Toole wrote. Deborah Judd, a 56-year-old teacher, was driving home from work Wednesday when she was shot twice near Sand Point Way Northeast and Bartlett Avenue Northeast. The gunman then fired through the windshield of a Metro bus, striking driver Eric Stark, who was hailed as a hero for backing the bus out of the area to safety, despite a serious gunshot wound to his chest. Judd and Stark, 53, survived their injuries. The gunman then shot the driver of a red Prius in the face, threw his body onto the ground, shot him again, and then stole his car as police were arriving. The Prius driver, Robert Hassan, was a 76-year-old retired physician and Air Force colonel driving home after playing pinochle with friends, according to his brother. He died of his injuries. The gunman sped south on Sand Point Way and collided head-on with another vehicle driven by Richard T. Lee, 75, a longtime Lake City resident who was pinned in his car and died of his injuries. On Thursday afternoon, Seattle police identified a fifth victim, who turned out to be the first driver the gunman shot at, the charges say. The woman was driving north on Sand Point Way when a man stepped into the street and took up a “shooting stance” several yards in front of her car. He fired two shots at her vehicle but she swerved to the left and drove around him, then watched in her rear-view mirror as he shot at the car behind her, the charges say. She later noticed a bullet had struck her windshield and contacted Seattle police. Staff reporters Asia Fields and Evan Bush contributed to this report.